Pitpass currently has an excellent article on the ownership and finances of F1. If you want to worry about the future of the sport rather than accept Bernie's bland assurances that all is well, go have a read. Personally, I find all that a bit depressing and would rather consider the strange position of the FIA on the diffuser issue, as outlined by Negative Camber on Formula 1 Blog. We learned yesterday that the Brawn BGP 001 is one of the cars included in Flavio Briatore's list of illegal exploiters of the rules on diffusers, the others being Williams and Toyota. Charlie Whiting has had a look at the offending diffusers, mumbled something to himself and wandered off, and Mosley has opined that they are legal but the FIA could change its mind if the diffusers are protested in Melbourne. Wonderful, isn't it? The body that writes the rules is incapable of giving a clear decision and leaves it open for yet another furore to break out in the first race of the season. This is unfair to both the teams who have been clever enough to design a diffuser that sticks to the letter of the law, if not its spirit (and who decides what that spirit is? ), and so risk seeing their ingenuity cancelled out, while the other teams have no idea whether they should be devoting some of their greatly reduced budgets to the design of similar diffusers. It is not a way for the governing body of an international sport to behave. If the rule is unclear, it should have been re-written as soon as it became apparent that its intent had been circumvented by certain designers. 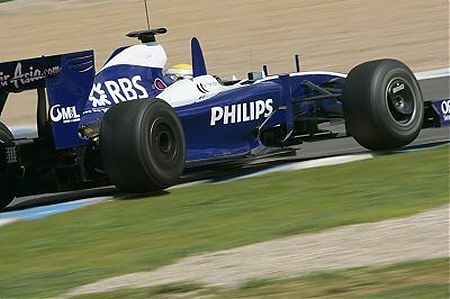 The last thing F1 needs is yet another upset like the movable floors controversy of 2007; enthusiasts are still debating whether Kimi's win should stand since it was achieved in a car that could be regarded as illegal. It is too late now for the rule to be amended. The FIA should stand by their present opinion and allow the diffusers to be used this year. If, on reflection, they decide that the workaround is not what they want in the sport, let them ban it at the end of the season. That is fairest of all, allowing the innovating teams to benefit from the time and money spent on their idea and requiring only that the other teams follow their lead if they think the diffusers give sufficient performance increase to be worth it. And that is the key; do the diffusers make that much difference? Perhaps it is ironic that Piquet Jnr in the Renault is currently setting times very close to the best that the Brawn GP has managed so far today; Alonso would almost certainly do better still. So what is the beef, Flav? Your car is looking pretty competitive without the fancy diffuser so why not just race and see who wins? Be annoyed, if you will, that a few engineers have beaten yours to the punch for once but, for pete's sake, let's not have any protests in Melbourne, please. It seems that the renaults are effectively running qualifying setup with low fuel etc and that is why they are appearing quick. It also seems that Maclaren have found some speed as they are now only around a second off the Braun rather than the 2+ seconds before. Yeah, Lee, I figured that the Renault (and probably the Williams too) is trying out for qualifying times today and so their times may not be truly representative of race pace. But we don't know if Brawn GP are doing the same. Ah well, at least McLaren are getting closer so I wasn't wrong when I said they would fix the problem quickly. It's not done yet but they're getting on top of it. Precisely, Lee - stewards deciding the interpretations of rules they don't understand yet again. Sometimes I despair. It is infuriating that the FIA refuses to make a definitive judgment regarding this issue. Team owners should demand that the FIA make a clear determination. I think the teams should ask their sponsors for some help in pressuring the FIA to govern the sport effectively. Money talks; if sponsors threatened to pull out, I would hope that the FIA would be more responsive. After all, it isn't fair to ask a team to tighten their belts when the rules aren't clear and reliable. I couldn't agree more, Marc. And when the FIA produces decisions like the one they did today (changing the points system, budget caps, etc. ), I am left thinking they will never, ever make a good decision. It wouldn't surprise me if the orders abruptly change when the racing starts and inspections become mandatory. After all, this has evolved in money circus thanks too Ecclestone. It makes sense to grab headlines where ever and when ever you can. The races are no longer the sacred territory. The jackasses that are running F1 are turning the rule book into "legalese" which has little or nothing to do with technical outlines or documents. When parts are made to the "spirit" of the design and not to precise standards, they don't work. The idea one can judge dimensions by intangibles such as spirit is biggest pile of rubbish I've heard from these people yet. Passing the buck to the mindless stewards is second! The despotic behaviour of the F1 dictators will only provoke more dissension if not mutiny. The article at Negative Camber is basically good news. Long before cars were plastered with ads, great drivers and designers were racing. When Ecclestone and the money bins sink or run, these same people will be making and racing cars no matter what the budget or no matter how many fans come out. These money grubbers have been a bane to the sport as has been the FIA with its power plays. The drivers and engineers have never failed to entertain despite these creeps. Local cops can't seem to stop racing. Ecclestone and his mercenaries could be swallowed up by quicksand today and the show would still go on!! When the authorities start referring to the "spirit" of the rules, you can be sure they are just annoyed that someone has managed to circumvent them - it's basically an admission that they did not write the rule well enough to cover all loopholes. I fail to see why those who find the loopholes should pay for their ingenuity in exploiting them. It's a game that has been played out between rulemakers and players since the invention of sport and it is only fair that the players should have the benefit of their better understanding of the game. Max wants to win every time, in spite of his bad framing of the rules and he does not care how unfair that is. Agreed that there will always be racing - but it would be nice if we could keep the cars as the technical wonders they are! I don't think the huge amounts of money are solely responsible for the cars being technical wonders. It may be the quick way to get there or catch up. The money has turned F1 into an elite's game where it used to be a game of ingenuity. Innovation is spawned by necessity more than by riches. Through this time of riches there have been many incremental jumps forward. In the past, with far less money involved, the changes were larger and a result of thinking outside the envelope instead of perfecting what's already in the envelope. By now I should be old enough and seen this sort of garbage often enough to ignore it but it just gets more and more annoying. How can they operate with a set of rules and manner of managing them like this. It's outside the rules but it is legal but at some later date we may decide it is not. That is insane. I hope the teams stick together and set up a breakaway series with sensible rules. Nick: Good analysis and a reminder that money does not mean the correct answer every time. Oh, for the days of brilliant solutions to problems we mere mortals were hardly aware of! Steven: I get more pessimistic about a breakaway ever happening as time goes on. It requires a unity between the teams that is almost certainly beyond them. But they do have an ace in that a concerted threat to withdraw from F1 would be a powerful influence on the FIA. Without the manufacturers' teams F1 would not exist (as things stand at the moment) and Max and Bernie would be a good deal more reasonable if they were faced with such a possibility. The FIA needs to be like the organisers of dinghy sailing competition. They release a new rulebook every three years after considerable consultation. Rules have to be well though-out because any errors will be there for three years of competition (and 75% of the time this will include an Olympic sailing event). If any errors are noted after the release of the rules, feedback is obtained from sailors and clubs and there is latitude for the clubs to try out possible rule changes they think might solve the problem, as long as it's not during an official race. This feedback means that rules rarely need fixing once and hardly ever twice. I think the protests at Melbourne will depend on who wins. If Flav is beaten by Brawn or Toyota or Williams he will certainly protest, Then what? With the test ban in place, whichever side loses the protest will have to try to design a new diffuser during practice for the next race, or 2, or 3. Here's one for you to consider: in the 70s GM changed their NASCAR body to one which had a vertical rear window. You can imagine what that did to the airflow to the spoiler mounted on the decklid. No air, no downforce. One of the Allison Brothers somehow secretly built and tested a car using a body from a cheaper Pontiac model that had a sloping rear window providing a much smoother airflow to the rear spoiler, more downforce! In qualifying he was on pole by 2.5 miles an hour, an enormous gap in NASCAR. In the 125 mile qualifying race on Thursday he simply drove away from the field. On Friday morning he was told he would have to cut his spoiler from 4 inches to 2 1/2 inches in height for Sunday's race with only a brief practice session to see how it would work. It didn't work at all. In the race the car was quickly swallowed up by the pack, totally uncompetitive. By the next race he was running the "approved" GM Body. How's that for rules making. Hi all. There is a tragic flaw in our precious Constitution, and I don't know what can be done to fix it. This is it: Only nut cases want to be president. I am from Marino and also now teach English, give please true I wrote the following sentence: "Expert tools and tips help you with search engine optimization of your site or blog.Search engine optimization can deliver you more visitors, we start our seo work, building links to your site through exchanges and directory submissions."